Home baking is synonymous to the households in Kottayam. Rahel, in God of Small Things fondly remembers Mamachi’s Paradise Pickles and Preserves, for the indigenous array of savories and an unclassifiable banana jam. It concretes the fact that entrepreneurial baking instincts are innate here. The Deli is a Kottayam based baking venture started in 2018 by two self-taught, home bakers Roshni and Beeda. It was not just following a dream but a post-lunch dessert craving that now delivers scintillating baked delicacies all over town. Organizing a charity sale for the first time, they talk about The Deli. Q.There must be a story behind ‘The Deli‘. With the concept of home baking not new to the city, what makes this venture of yours special? We are two home bakers in love with anything chocolate and stylishly sweet. One lazy afternoon after lunch, both of us were craving something gooey and chocolatey. It was then the idea struck. If only there was a place that could offer us dessert! Thus the ‘The Deli’ Kottayam was born. Ours is a small space and we intend to keep it that way to assure and retain quality and deliciousness. Q. Apart from the usual course, The Deli ventures into creating goodies that are exotic for our palate. Keeping aside the joy of shaping up something exemplary, sourcing the ingredients could be a herculean task. How do you procure the necessary ingredients for your signature recipes? We would partly agree with it. Since we are based here in Kottayam sourcing some of the required ingredients are at times difficult. Once we finalize on our recipe, we check with the stores from where we usually buy. Otherwise, we procure it online. Few of them are sourced from relatives and friends living or traveling abroad. Q. This is the first sale for charity orgnaised by The Deli. Could you brief us about these initiatives and share your experience with the kids in ‘Santhwanam’? Charity could be an overrated term. We feel it’s about counting your blessings and sharing the blessings with the ones that deserve it. I was introduced to Santhwanam by my friend. Santhwanam is a home with ninety inmates where we paid a visit to, a couple of times. We were touched by their love and innocence and wanted to lend out a helping hand to them. Taking into consideration the plans they have for expanding the space, we finalized that a sustainable solution would be helping them with money rather than kind. Both of our birthdays fall in March, so we thought it would be better if we did it this month. Through this sale, we aim to pool in genuine involvement and create awareness. Considering the footfall at the DC Books outlets we were able to finalize a space for the same at their branch in Kanjikuzhy, hoping to meet people who drop in for a good read and deed on this Saturday. Q. Though Beeda has had her share of culinary experience at the Taj, Roshni is a new entrant to this field. How do you finalize on a recipe? Do you insist on improvisations on the recipes that strike a chord and what is your source of inspiration? With a sweet tooth, our foremost inspiration is craving. Each dessert has its own quintessential flavour and texture. Baking is a science and understanding that is what is most important we feel. All the goodies we have tried could share a story of failures. The longest we can remember is one with macaroons which failed over twenty times on a single day! After episodes of trials and errors, we learn and once we master, we improvise. Masterchef has always been an inspiration. Apart from that we read articles online and watch videos keep ourselves updated. Q. How is the usual flow of orders? What are your signature goodies? We usually take up orders through our Instagram page the_deli_kottayam and personal orders as well. We have also roped in Skidoo, the online food delivery app for delivery within a 12km radius around Kottayam town. We try to give a signature ‘Deli touch’ to everything we bake. Macaroons, salted caramel sauce, cakes, puddings, and cinnamon rolls are the favourite picks. Christmas is the busiest season when we literally race against time. Q. Is there anything in the pipeline regarding the expansion of this as a community, conducting baking classes and making the edibles healthier? As of now, we haven’t made any plans about workshops in Kottayam. We have plans to conduct one in Trichy which is not finalized yet. We are still improvising on an Indian Dessert. We are planning to introduce a keto and vegan-friendly range of edibles and also trying out new desserts with organic and healthier substitutes, without compromising the taste quotient. 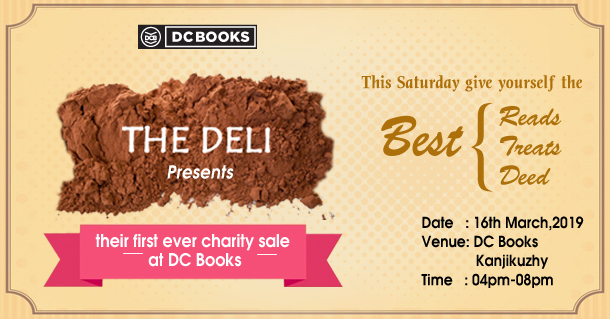 The charity sale by The Deli is on Saturday 16th March, at the DC Books outlet, Kanjikuzhy, from 4 pm to 8 pm.